If you have had a delicious meal at the Hilton Garden Inn in Watertown, you can give credit to a BOCES graduate for ensuring that your dining experience was a pleasant one. Matthew Hudson is the Executive Chef at the hotel, having been employed there since the establishment opened 8 years ago. He is a 2002 graduate of Thousand Islands Central School and of the Culinary Arts program at the Bohlen Technical Center. Chef Hudson says he knew at an early age that the restaurant industry is where he wanted to be. It was that desire that led him to enroll in the Culinary Arts program at BOCES his junior year of high school. During his two years at BOCES, he was taught by current Culinary Arts Instructor Chef William Landers. Chef Hudson says he wanted to continue with his training that he had received at his previous jobs and looked to move his career forward. 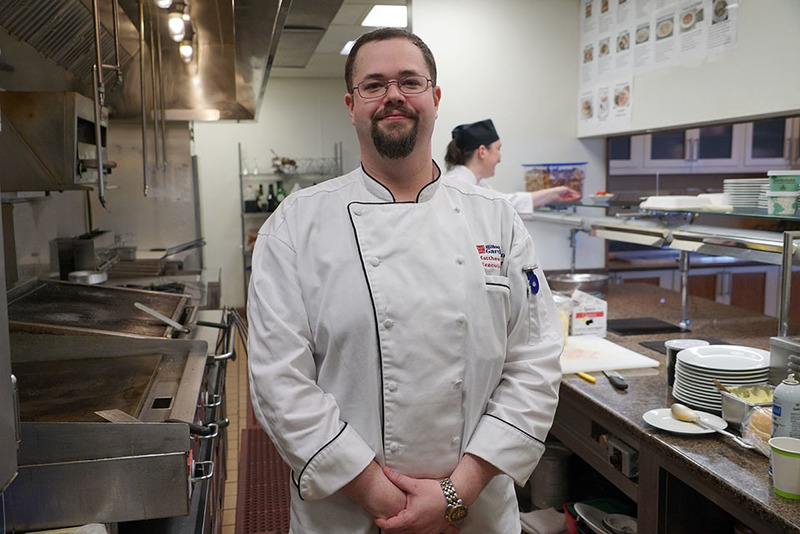 Chef Hudson has worked with other BOCES graduates in his kitchen, including Allen Shay, 2007 Watertown High School and Culinary Arts program graduate. Chef Hudson says his favorite experiences at BOCES included making lunches for staff and learning how to make wedding cakes. He also took part in the VICA competitions (now known as SkillsUSA). Following his high school graduation, Chef Hudson worked for two years before attending Paul Smith’s College, where he graduated in 2006 with an Associate’s Degree in Culinary Arts. He then found an externship at Kent Island, MD before returning to the North Country, working at the Lyric Coffee House in Clayton. In August of 2009, he began working at the Hilton Garden at the Executive Chef. Chef Hudson can’t recommend enough the experience he received through the Career & Technical Education program at BOCES. To learn more about the Culinary Arts/Cooking program, click here. To learn more about the Culinary Arts/Baking program, click here.